A pen just broke on me. | Inkdependence! A pen just broke on me. Blarg. The inner sleeve of the section in my TWSBI Vac 700 just broke. 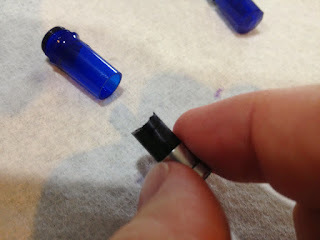 Ink poured out of the nib when that went down. I just emailed Philip at TWSBI. I bet he sends me a replacement very soon. They're good about this sort of thing at TWSBI. **Edit: Philip put a replacement in the mail today. Want good customer service? Buy a TWSBI. I agree. I have gotten two replacement Diamond series pen barrels in two weeks due to congenital cracking issues. Sadly my red 530 will now be red knob and cap with clear body, but the customer service is top notch. A couple of blues from the road. The July 2013 Ink Drop "America!"